This weekend John and I dumped Wes off at another family’s house, got a 4-star hotel off Priceline.com for 40% off, and spent a couple nights in The Big City. Travel Savvy Tip: Before you bid on a hotel on Priceline.com go to betterbidding.com or biddingfortravel.com to see what rate other people have been winning hotel stays with. These Web sites also teach you about “free rebids” and how to use them to maximize your bidding experience. Friday night we ate dinner at Christopher’s. It was perfect: ambiance lighting, soft jazzy music, and delicious food. As we ate we realized it had been a long time since we had gone out for a nice dinner together, just the two of us. It was nice. Travel Savvy Tip: When you stay at a nice hotel, book your dinner reservation through the concierge. First, it saves you the hassle of doing it yourself, and second, often they have partnerships with area restaurants and can offer you discounts or special offers. We got a free appetizer coupon through our concierge, but we ended up not using it because we were eating early enough to order their early bird special–four courses for $28. I had shrimp cocktail (yum), green salad (yum), Parmesan encrusted halibut (oh my gosh yum) with mashed potatoes and green beans, and for dessert bread pudding (on the floor dying of yumness). The halibut, too, I was surprised by, probably because I don’t eat a lot of fish and the only other halibut I’d had was at Magleby’s (the place that tries to pass itself off as a nice restaurant but is really sub-standard–except for their chocolate cake, which is made by someone outside the restaurant named Lenora and is really to die for), and let’s just say the fish at Magleby’s Was. Not. Good. But the Parmesan encrusted halibut at Christopher’s was juicy and tasty and melted in your mouth. So glad I got that. After dinner we walked around Temple Square. There was a concert in the Tabernacle by the Orchestra on Temple Square. It had already started by the time we got there. We waited outside, and during a break between songs we were allowed in. We heard a song by a 12-year-old virtuoso pianist from Hong Kong and then an orchestra piece by Wagner. I play the cello and love orchestra concerts, so this was a nice treat. After the concert we walked to the Joseph Smith Memorial Building and watched the movie about Joseph Smith. It was sad. Good, but sad. It’s hard to watch a lifetime of trials and hardship condensed into an hour and ten minutes. But it put me in awe of how faithful and obedient Joseph was even when he didn’t know God’s plan for him. No matter your religious background or personal beliefs, you should admire Joseph’s willingness to obey faithfully. Saturday was actually the reason we came to Salt Lake City. I attended a Zumba instructor training workshop. It’s meant for people who want to teach Zumba but never have. Because I already teach Zumba and am a member of the Instructor Network I could take the workshop for half price. It was a good review and so much fun! One of my students-turned-instructor was there, which made it even more fun. That’s her on the left, with Lindsey (who led the workshop), and me. We jammed all day long with the merengue, cumbia, salsa, and reggaeton. It was great to meet the new soon-to-be-instructors, and I set some new goals for myself as a Zumba instructor. Back at the hotel John and I went swimming, sat in the hot tub, and visited the sauna. The hot tub and sauna felt SO GOOD. And normally I don’t like saunas. They’re too hot. But it felt good on my body after being so active all day long. Travel Savvy Tip: Before you travel someplace go to Tripadvisor.com and research your hotel, restaurants, and activities. There’s a wealth of information there from other travelers who have been there, done that, so you can know before you go what to expect. We came home on Sunday and picked up Wesley. He didn’t seem to miss us at all. I didn’t hear much about what he did while we were gone, except that he went to two basketball games, got a pony ride, and had a lot of fun. Hannah here. Glad you had fun. 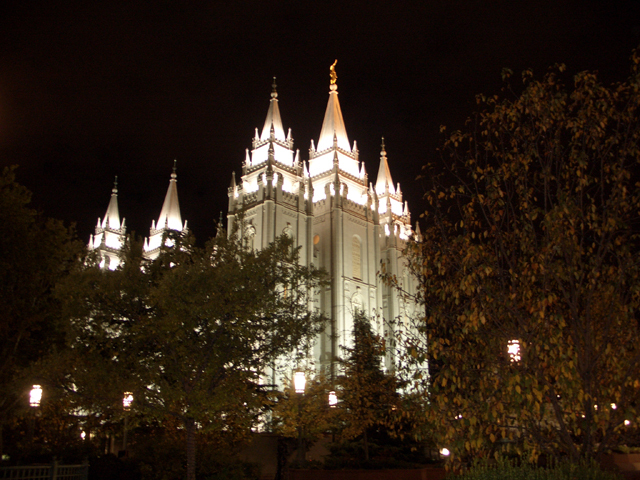 I miss Salt lake. Than’s good to know it’s still there. Thanks for the pictures. It was nice to see our old hood.